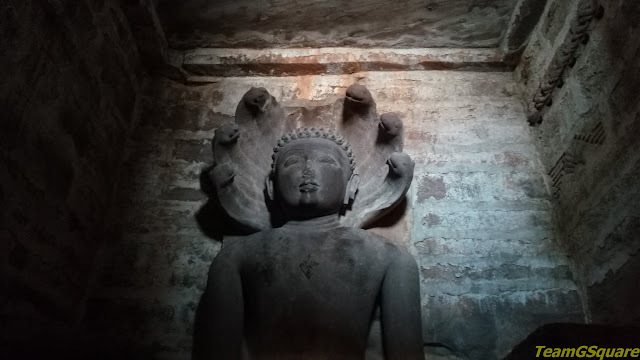 Every other artifact present at the ASI Museum of Chanderi was associated with the place of Budhi Chanderi, which increased our curiosity about the historical significance of this place. As Budhi Chanderi was only about 16 km from Chanderi, we decided to explore this place post lunch. 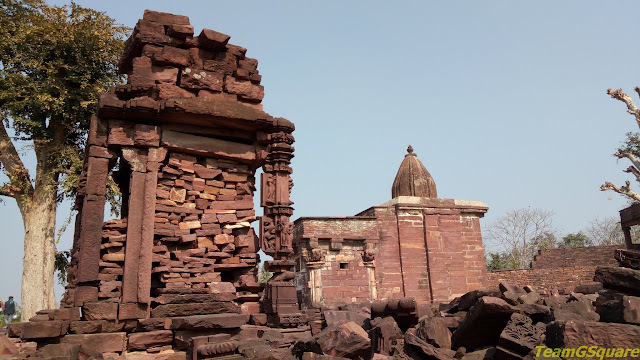 Being much older than the town of Chanderi, Budhi Chanderi (Old Chanderi) is believed to be the town of Chaidnagar which finds its mention in the Puranas, signifying its antiqueness. The Old Chanderi lies inside the forested area and is believed to house more than 55 Jain and Hindu temples, most of which are in ruins. The ASI has collected more than 2500 artifacts from Budhi Chanderi and its surrounding areas, most of which are preserved at the Chanderi Museum. The temples here are believed to have been built between 9th - 11th centuries by the Pratihara kings. The drive to this place was pleasant and the winding roads only added to our excitement. We had enough company on the roads as it was the first day of New Year. We were welcomed by the ruins of fort walls and as we continued our drive, we reached a temple which seemed to be functional. 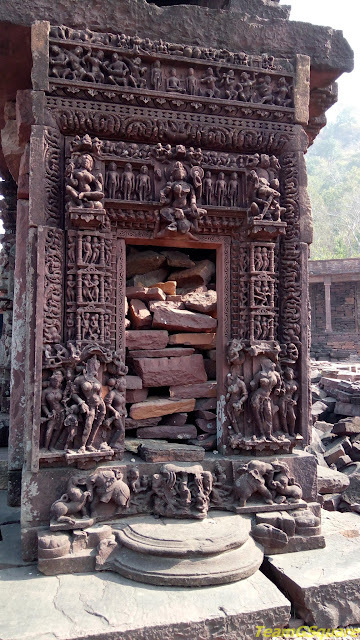 We drove further to investigate the surroundings and found an ancient temple complex. My wife took the lead to check if this was the site we are on the lookout for. A flight of steps led to the entrance of the temple complex. On entering the complex, she noticed the presence of numerous temples enclosed inside the compound wall and very excitingly invited me and our little to come and witness the same. The guide at the complex confirmed it to be Jain temple complex and the same was evident from the images and sculptures here. 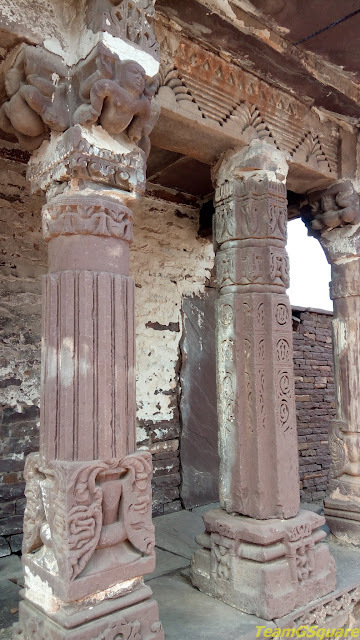 The architecture is similar to that of the Badoh Pathari Jain temple. Sadly, the ASI has repeated its shoddy restoration work here, with the walls resembling a jigsaw puzzle. Nevertheless, it has been successful in bringing back the temple complex to shape, for us to at least realize its grandeur. We thoroughly enjoyed exploring this temple complex. All the five temples here are dedicated to Jain Tirthankaras. After spending a good time, we decided to head on to our next destination after thanking and bidding a good bye to the care taker. He handed us a register in which we were supposed to enter the details of our visit and as we did it, we realized that we were the first registered visitors of the year 2017 to this place! Iver heard about it...its so beautiful, the architectural works are mind blowing.Thanks a lot for sharing about such a fantastic place. Great to read about the temple. Amazing. I am a fan of your MP diaries. Waiting to go there. What a way to start a new year! This is a fascinating historical place, and I agree that the grandeur of the temple complex can still be seen. Thanks for taking us along with you. Intricately Carved Door Jamb is simply amazing.Wonderful way to start the New Year by visiting these places. 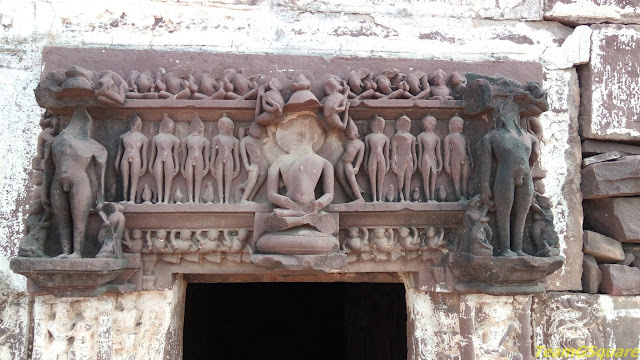 Wonderful shots of Jain temples.